The Stockman 4500 Live Drives are a rugged range of ride-on mowers. Every model delivers performance, quality and engineering integrity, plus every machine features the proven Cox friction drive system with unmatched simplicity. When there is more than a couple of acres to be mowed and you want your mower to last the distance Stockman 4500 delivers the goods. 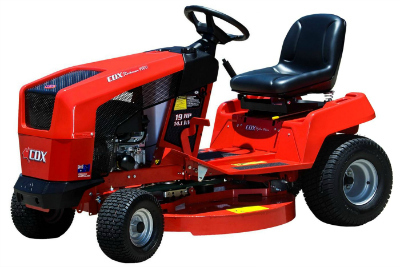 Fitted with a Briggs & Stratton engine & combined with either our 35” (890mm) fabricated deck or our 42” (1055mm) fabricated deck this mower is designed to take on the toughest terrain you can throw at it and turn it into lawn. The industrial strength polypropylene panels won’t rust and are resistant to scratches and minor dings. A comfortable & adjustable seat offers the operator a clear view of the terrain ahead. The pivoting front axle reduces stress on the chassis and helps reduce scalping over uneven ground. The large turf master tyres minimise ground impression and provide better traction on soft and damp turf. When you have finished mowing, all you have to do is just snap on a standard hose fitting and the underside of your deck will be cleared of accumulated grass clippings.